Here are some basic feng shui principles to help you to choose a good fengshui home. Classical feng shui states that physical forms i.e. environment act as the framework and energy for implementations “峦头为体，理气为用”. In short it is the importance between physical environment and invisible energy. Using google map or singapore street directory study the physical infrastructure leading to your house i.e. the roads, lift lobbies, corridor, shape of roads leading to your home. External environment is fixed unlike internal placement where you are still have some flexibility to change. 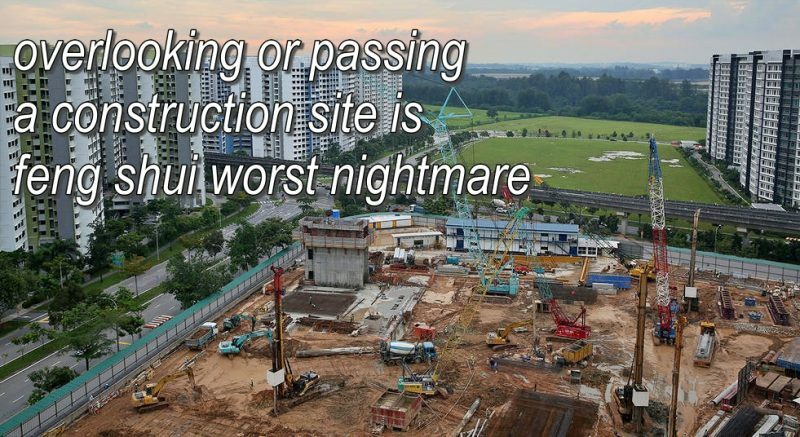 However understanding Singapore there is always “construction” going on which i find is the Worst Feng Shui Nightmare! Personally i do find new BTO homes generally have this serious problem particularly when an area is targeted for development e.g. Punggol 21. The dust are unsettled and so is the feng shui energy. Observe the location of your stack/block in relation to other buildings. The physical terrain of the 4 main “mountain 山势” influence such as the front 前朱雀, the back 後玄武, left hand sid 左青龙 and the right 右白虎. If you have to compromise facing a spacious front is relatively more important. 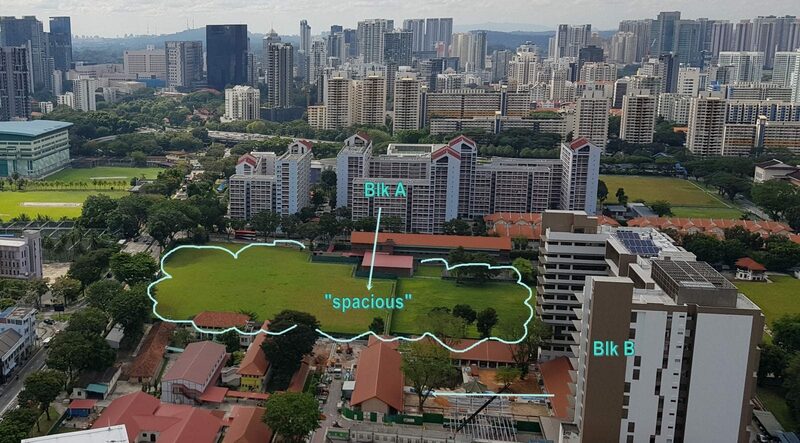 See picture below Blk A is better than Blk B. Study the floor plan meticulously. What is the shape of the floor plan? Square, rectangle or out of shape? Where are the positions of main door, stove and bed? Where are the locations of North, South, East, West, Northeast, Southeast, Northwest, Southwest and ideally if you are using the luopan having 24 mountain segment is even more useful. How is the main door in relation to kitchen-stove or bedroom position? Any serious missing sectors (25% of the total floor size)? Do not choose a house that is out-of-shape or the rectangular form ratio that is greater that 1:3. You will have very uneven size for a given sector and those smaller sectors maybe the positive ones such as wealth, health, career etc. See picture below North and South sector are extremely small to utilise IF it is the Wealth or Career areas. In Singapore feng shui, there are no perfect home or business office that fits like a glove unless your develop the home yourself base on an empty plot of land. Even so you are still limited by URA rules and guidelines. Do not buy a house or office with tilted doors. The fact that some feng shui masters are so obsessed to tilt the door for their clients is because they believed that the house “negative” energies will improve permanently by tilting the door! It does not work and the energies will not “changed”. Energies does not go sideways when you tilt the door. So if you see that the door is tilted it is clear signal telling you the house is bad. There are other ways to rectify bad energies BUT tilting doors is not one of them. Similar to point 1, but here refers to the physical landscape such as sharp pointed buildings, highly reflective mirrors, hospitals, police stations etc. How do we judge the negative influence depend on the distant and the view from your house. Do you need powerful binoculars to see the hospital then there is little danger. Or sometimes negative landscape could be blocked by trees or a wide road with heavy traffic, then it is not as serious as it seem. As a general rule of thumb in Period 8 Year 2004 to 2023, refrain from seeing “artificial water” like roads, junctions, MRTs in the North-East Sector/direction using your house centre as the focal point. Instead you should see buildings. In a very general sense, Mountain or tall buildings in today’s context equates health. Water in feng shui equates Wealth (not because of the cantonese word shui is wealth). However water is not the only medium to activate wealth. Roads are just as important. Check the degree of your main door direction to find out “rough destiny” of your apartment by plotting out the degree using the siteplan “North”, then check the table found in this website. Feng Shui dated many many years ago and during that time most theories are bias towards the “male breadwinner (封建思想 feudal society)”. So finding a house based solely on the male breadwinner does not work today! Nowadays the female counterpart may even earn more than her husband. Thus searching for a feng shui house is never about bazi compatibility or gua number, unless your entire family shared a single “八字用神 lucky element” which is quire rare. Any bad things could have happen such as disaster, accidents, surgeries, sickness, suicide, lawsuit, disharmony, evil spirits that you possibly can imagine could happen in the above orientations.